An important consideration when responding to reviews is make it timely. Try and respond to all reviews, positive or negative within 24 hours. Positives you have more wiggle room for slower responses, but negative reviews you want to pounce on them within minutes or hours if possible. Why respond to a positive review? It’s the polite thing to do. If customer gave you a compliment in real life, you would say thank you. It’s only polite. And with an online review, the compliment is public. So be extra nice! It affects search rankings. By replying properly, you can improve the SEO ranking of the review, and help the review show up in search results for a business. Step 1: Thank the customer for the positive review and be specific. Step 2: Use the business name and keywords in your review response to the good review. Step 3: Add a little marketing to your review response. Step 4: Invite your customer to do something in your response. 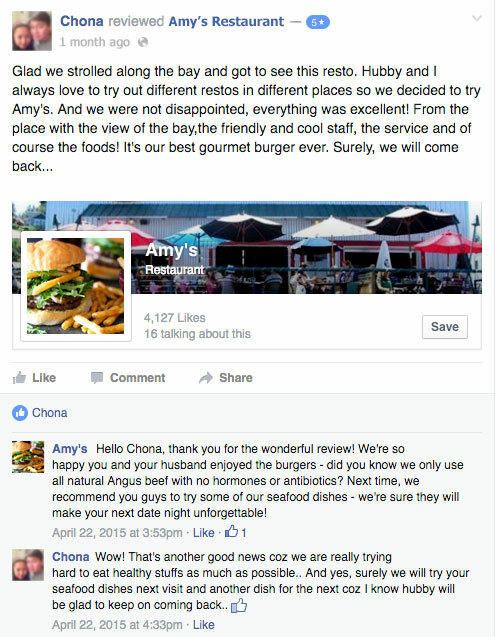 Amy’s Restaurant energetically thanked the customer for their feedback, then included some subtle selling, specifically about their hormone and antibiotic free beef, then about their seafood dishes. This response clearly left a great impression on the customer as you can see from their reply. Do you think this customer will be coming back to Amy’s? or better yet, brining their friends next time? 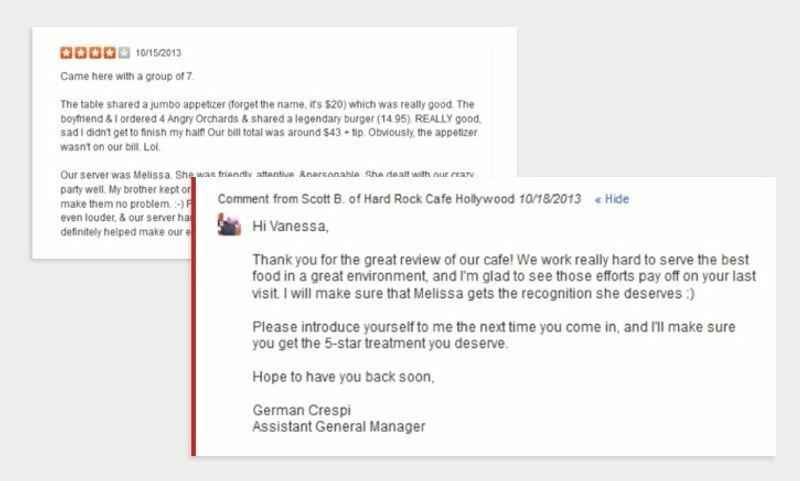 Hard Rock Cafe in Hollywood shows a great example of recognising staff in the response. Its personal, it speaks directly to the comment that was left by the customer and it recognises the staff member that provided a great experience for this customer. This shows leadership and would give a customer the impression that the Hard Rock Cafe in Hollywood has a great culture. This is the part that most business owners dread or have some level of anxiety about. Particularly if they are not currently active on social media, but are considering the necessity of it. Remember, you’re not just replying to just the one reviewer. You’re speaking to everyone who reads this review, including potential future customers. Step 1: Apologise and sympathise in your response to the negative review. Step 2: Insert some subtle marketing into your response to the bad review. Important Note: Do NOT include the business name or relevant search keywords in your response to a negative review. You don’t want this review showing up in search results! Don’t just respond to the review. Resolve the issue, too. A timely, well-worded response to a bad review is a good start, but don’t think there won’t be work left to do after that. Analyse what the customer said to identify the bigger or deeper issue at hand, then put this issue under control. So, for example, if a customer complained of his or her experience with your rude sales representative, don’t just respond and pay online lip service. If you haven’t responded to the customer’s negative feedback yet, it is best to find out the customer’s issue. You can follow the steps above and use the review response templates if you would like some help with phrasing your review response to the bad review. As stated previously, try to move the conversation offline to get to the heart of the issue, without letting the whole world see the dirty laundry online. Try to resolve the issue as best as you can to make the customer happy and wanting to return to you again. Step 3: Get more positive reviews to bury the negative review. Owning up to your mistakes goes a long way. Accidentally overcooked the veggies? Say so. And say sorry. Which is exactly what Samovar did. The tea lounge also explained all the possible reasons why the salmon might not have been up to standards when Anna L. came in, or how broth sauce that’s off could ruin the tea soup. 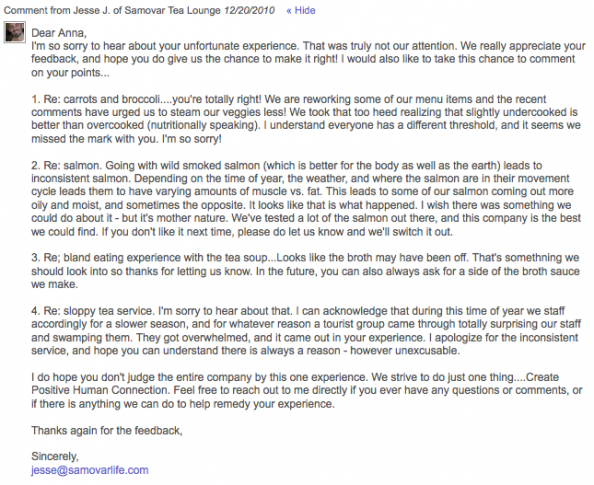 The key insight here is: Samovar addressed specific issues raised by the Yelp reviewer – and let her know that they are already working on these issues to remedy and improve the customer experience. The terrific response is also capped off by an open invitation for the reviewer to reach out to the business owner / manager directly, with the encouragement to sound out more questions and comments. Joan C. of Brooklyn, New York and her friends made a reservation at Anella in Brooklyn. Unfortunately, the rest of her party was “lost somewhere” in the Greenpoint neighbourhood. With the restaurant applying a strict rule about not seating incomplete parties, Joan did not come away happy and thus wrote this one-star Yelp review. Below it is the response of Blair P., the owner of Anella. 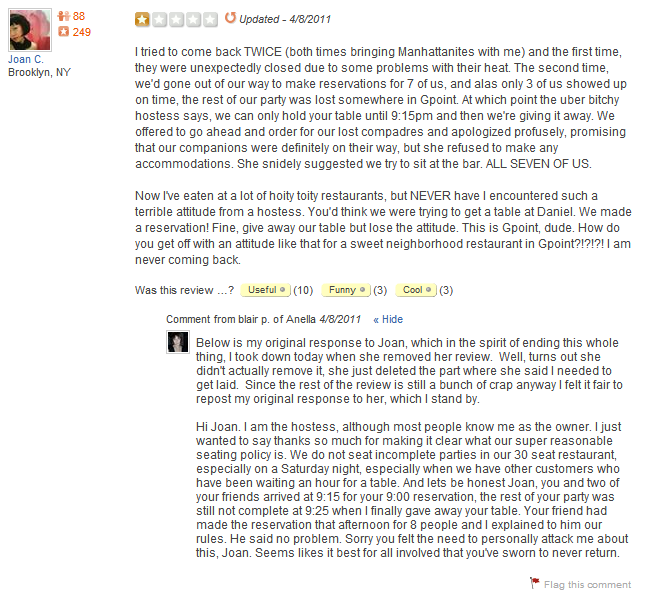 In her review, Joan C. didn’t hold back, even going so far as to use the phrase “uber bitchy” to refer to Blair P. This, of course, is not the fairest way to react to a lost reservation: indeed, if Joan C. had to get mad at anyone, it had to be her friends. Blair’s response just goes to show that if a Yelper makes an unfair point and writes an unfair review, don’t hesitate to tell your side of the story. (“Let’s be honest, Joan: you and two of your friends arrived at 9:15 for your 9:00 reservation.”) In the real world, customers aren’t always right. But if they don’t think they wrong, and if they use this as a basis for making personal attacks, always keep calm and never let your emotions get the best of you while you write out a response. 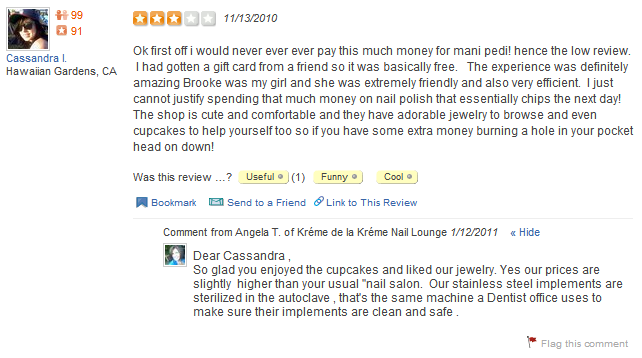 Kréme de la Kréme Nail Lounge is the recipient of dozens of positive reviews on Yelp. Angela T., the business owner, takes the time out to thank Yelpers who put in these good words for her. 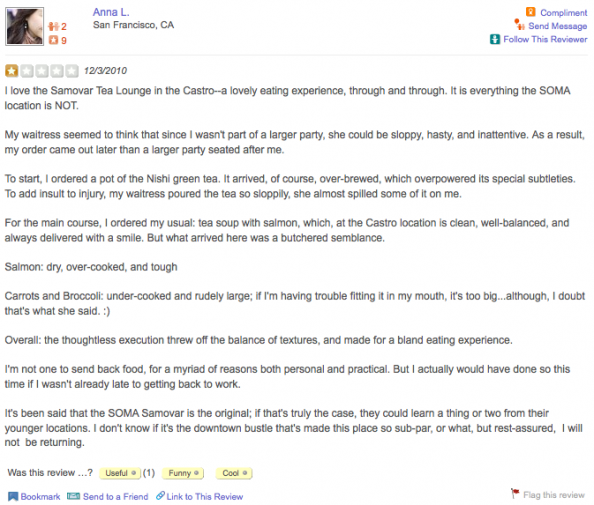 Whenever a bad review comes along – like this one from a honeymooning reviewer – Angela T. responds, too, in a way that just shows how seriously she takes her customers’ comments and critiques. Sometimes all a customer needs to know to want to return to your place is that your business cares. Ignore the snarky conclusion of her first response, and you get the sense that Angela T. is really serious about compensating customers who have had genuinely bad experiences at Kréme de la Kréme. It’s not just about admitting a mistake, but correcting it. Like Jesse J. of Samovar, Angela – as involved a business owner as any – also addresses specific issues, and works toward resolving these issues. Check out the second set of review and response, in which she explains why the nail salon’s prices are slightly higher than that of her competitors. Cassandra I. did not exactly leave an unkind review, but Angela nonetheless found a way to describe to her the great lengths the business goes to in order to provide quality services and products. Here, this dealership is handling this scathing review the best way possible. 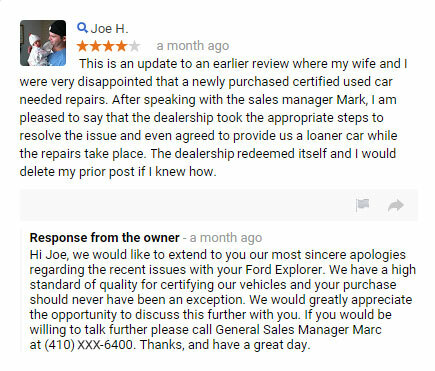 Best case scenario: below, a customer updated his review to 4-stars after the general sales manager contacted him and resolved the problem. 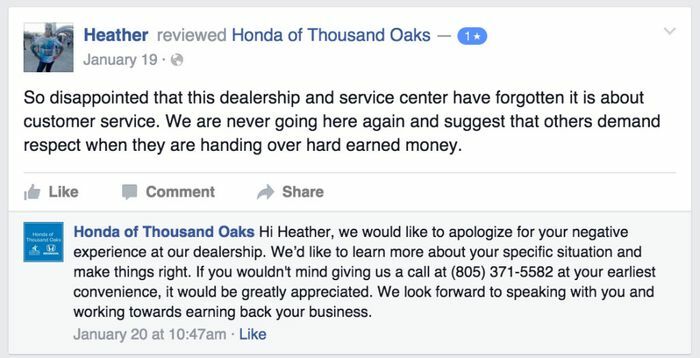 By sincerely acknowledging the mistake and offering to resolve the customers dissatisfaction personally, Honda of Thousand Oaks was able to get the customer to amend their review to a positive one. Some bigger restaurants and businesses have a PR agency or Internet marketing firm backing them up with online review monitoring, customer support, and full-blown reputation management. But not all businesses can afford to do that, so a lot of owners and managers themselves act as the primary spokesperson for their own businesses. Seastar Seafood Restaurant and Raw Bar in Bellevue has Chef John Howie. And Chef John Howie’s responses to Yelp reviews are not on Yelp, but on YouTube. Check it out by clicking the link below the screenshot. Why stop at leveraging the power of one major Internet player? By choosing the world’s most popular video site – YouTube – Seastar Seafood Restaurant and Raw Bar is able to expand their reach and show not just Yelpers, but YouTubers, too, just how much they value their customers’ comments and feedback. By adding a video element to the responses, Seastar Seafood Restaurant and Raw Bar is also able to humanize their brand, and lend a face – a personality – that existing and prospecting customers can identify or at least engage with. Having the chef himself respond to the reviews, moreover, establishes the credibility and authority of the responses. Lighten up. 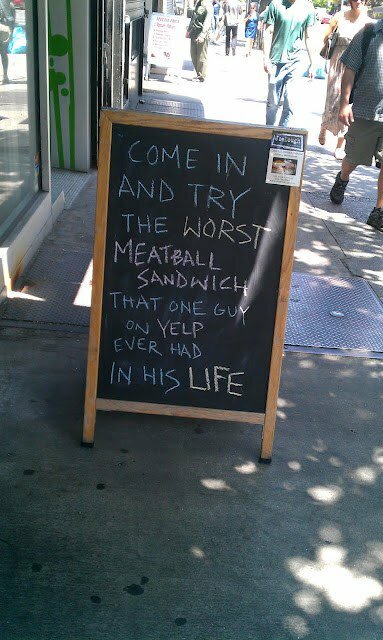 It’s Yelp. Don’t let a bad review take away your sense of humour. At the end of the day, the success of your business depends not on what one customer says – but rather on what you do, how you choose to respond, and what kind of attitude you take when addressing customer issues. This passive-aggressive response to a bad review, which you won’t see on Yelp, is funny, creative, passionate, and extremely catchy. And it went viral recently. You know what that means: tons of free publicity.